We are revisiting the Ojo de Dios knitted Shawl, but this time in jewel tones! In this kit you get the Interweave Knits Winter 2013 print edition, the PDF of the updated pattern showing the new colorway and 6 balls of the Plymouth Yarn Gina in colorway! Knit the popular Ojo de Dios modular shawl in a brand new colorway of Plymouth Gina with this exclusive knitting kit. Purples, greens, and blues shift subtly in the individual triangles, then create stripes in the long rows of the garter-stitch body. This kit provides you with everything you need to create the Ojo de Dios Shawl in the new colorway! Interweave Knits Winter 2013 brings you three storylines that hinge around a central theme of rugged-but-beautiful, tough-but-luxurious. 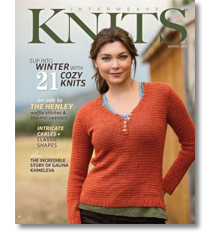 The patterns featured in this issue focus around the cable stitch. 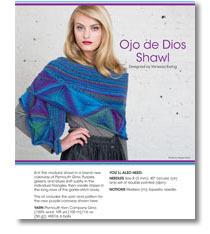 The Ojo de Dios Shawl to knit, designed by Vanessa Ewing is featured in this issue. Vanessa Ewing's Ojo de Dios shawl when finished measures about 63" wide and 13½" tall. Self-striping yarn creates intriguing effects in the motifs of the Ojo de Dios Shawl designed by Vanessa Ewing. The crescent-shaped wrap is built of modular triangles and garter stitch shaped with short-rows. *this PDF will appear in your shopping cart upon purchase of this kit, and then will be available for download. 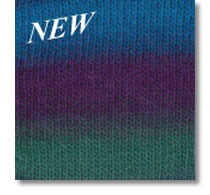 Gina yarn is a 100% wool, single ply yarn that has the colorways that all knitters clamber about. Let the colors do the work while you enjoy seeing your yarn create a masterpiece of art. Each skein contains 109 yards of worsted weight yarn. 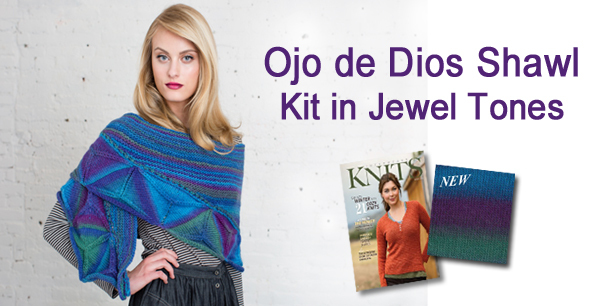 Order the Ojo de Dios Shawl Kit in Jewel Tones today!